The University of Antwerp is a young, dynamic and forward-thinking university. In 2016 it was ranked 11th in the “Top 50 Universities Under 50 years” and in 2018 it appeared in the Reuters top 100 of Europe’s most innovative universities. Also, the European Commission has awarded the university the “HR Excellence in Research” quality label. Recognizing a strong societal demand for research and education in the field of applied biological sciences, in 2006 the university created the Department of Bioscience Engineering within the Faculty of Science. The team led by Professor Vlaeminck has a core focus on resource-efficient microbial technology for nutrient management and system assessment of nutrient re-use in agriculture. For the SUSFERT project the university is carrying out the physico-chemical analysis of struvite samples from across Europe and beyond; seeking to determine optimal quality for further processing in SUSFERT and to understand the link between process parameters, type of waste water processed and struvite quality in Work Package “Probiotics and Struvites” (WP1). 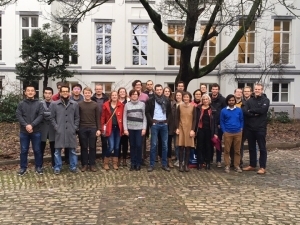 The University of Antwerp is also leading Work Package “Sustainability” (WP6) on environmental and economic analysis; it specifically carries out the Life Cycle Analysis of the SUSFERT production processes and products.